My Live Chat Plugin for Drupal allows collaborate with your Drupal website visitors. It is fully customizable, pretty light-weight, easy to install and requires just a free account at Mylivechat to complete the integration with Drupal websites. My LiveChat is a free, fast, high performance and most user-friendly live chat solution. It allows you to live chat with website visitors, monitor site traffic, and analyze visitors' web activities, including their search engine and keyword usage. This tutorial is designed for Drupal 8.x. If you are using Drupal 7.x, please check this tutorial. If you are using Drupal 6.x, please check this tutorial. Log on as an administrator and open the Manage-->Extend panel, then click on the "Configure" link of the Block. 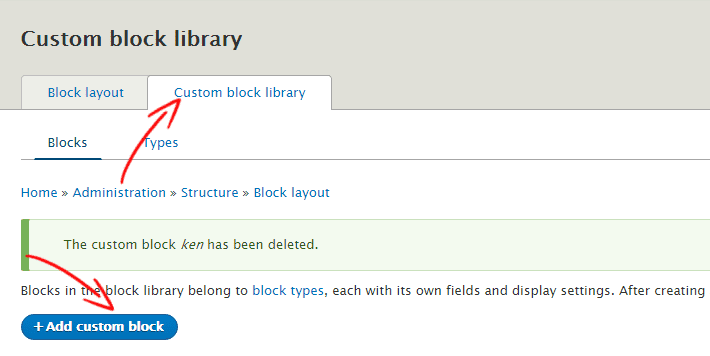 Switch to "Custom block library" tab and click on the "+Add custom block" button. Fill the "Block description" with any name you need and select "Full HTML" option from "Text format" dropdown list, then click on the "Source" button from the editor toolbar. Get your chat code from https://mylivechat.com/dashboard/deployment.ascx. Add chat code into the editor then cick the save button. Back to the "Block Layout" tab and click on the "Place block" button of "Header" block. 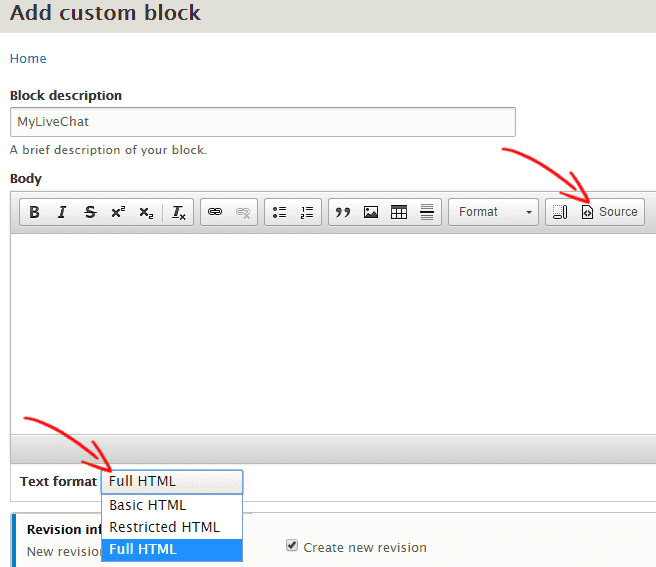 Select the MyLiveChat block what you just created then save it. Check your site, the live chat button should appear in youe drupal sites now.